Both intensive (industrial) and non-intensive (traditional) forms of meat production result in the release of significant amounts of greenhouse gases (GHGs). As meat supply and consumption increase around the world, more sustainable food systems must be encouraged. For many thousands of years, mankind has lived in close proximity with numerous animal species, providing them with food and shelter in exchange for their domestic use and for products such as meat and milk, feathers, wool and leather. As the economy in some (mostly western) countries slowly grew, industrial style agriculture replaced traditional small-scale farming. Pasturage and use of animal manure as fertilizer was abandoned. The increasing efficiency of industrial agriculture has led to reduced prices for many of our daily products. It helped to reliably nourish large populations, and turned a food that was an occasional meal—meat—into an affordable, every-day product for many (Figure 1). 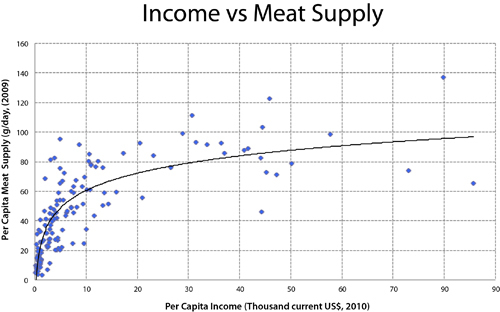 However, the true costs of industrial agriculture, and specifically „cheap meat“, have become more and more evident. Today, „the livestock sector emerges as one of the top two or three most significant contributors to the most serious environmental problems“ (Steinfeld et al. 2006). This includes stresses such as deforestation, desertification, „excretion of polluting nutrients, overuse of freshwater, inefficient use of energy, diverting food for use as feed and emission of GHGs“ (Janzen 2011). Perhaps the most worrisome impact of industrial meat production, analyzed and discussed in many scientific publications in recent years, is the role of livestock in climate change. The raising of livestock results in the emission of methane (CH4) from enteric fermentation1 and nitrous oxide (N2O) from excreted nitrogen, as well as from chemical nitrogenous (N) fertilizers used to produce the feed for the many animals often packed into „landless“ Concentrated Animal Feeding Operations (CAFOs) (Lesschen et al. 2011, Herrero et al 2011, O’Mara 2011, Janzen 2011, Reay et al. 2012). 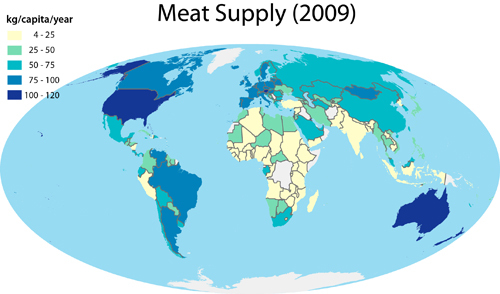 Meat supply varies enormously from region to region, and large differences are visible within regions (Figures 2-4). The USA leads by far with over 322 grams of meat2 per person per day (120 kg per year), with Australia and New Zealand close behind. Europeans consume slightly more than 200 grams of meat (76 kg per year); almost as much as do South Americans (especially in Argentina, Brazil and Venezuela). Although Asia’s meat consumption is only 25 per cent of the U.S. average (84 grams per day, 31 kg per year), there are large differences, for example, between the two most populous countries: China consumes 160 grams per day, India only 12 grams per day. The average meat consumption globally is 115 grams per day (42 kg per year). Over the past few decades, meat supply has grown in most of the world’s regions (Figure 4), with Europe being the main exception. The growth in per capita consumption is strongly linked to increasing levels of income in many countries of the world (Figure 5). 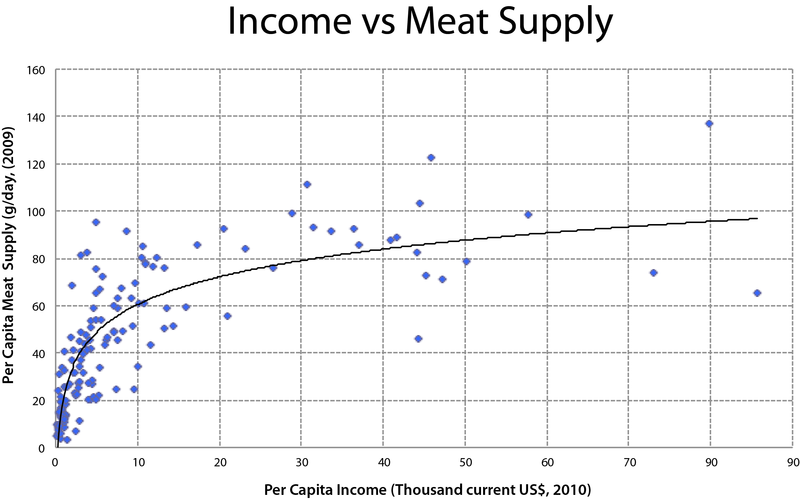 Higher incomes translate into demand for more valued, higher protein nutrition (Delgado et al. 1999). The effect of increased income on diets is greatest among lower- and middle-income populations (WRI 2005). One of the fastest growing meat consuming regions is Asia, particularly China. Total meat consumption has increased 30-fold since 1961 in Asia, and by 165 per cent since 1990 in China. Per capita meat consumption has grown by a factor of 15 since 1961 in Asia and by 130 per cent since 1990 in China (FAO 2012a). 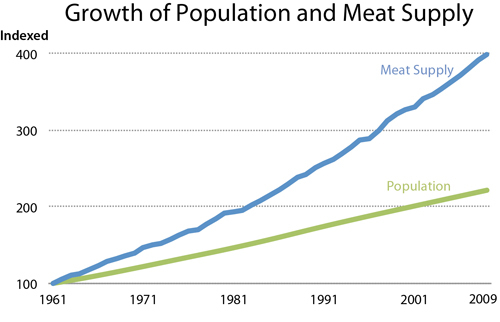 Not only has per capita consumption grown, but there are also millions more consumers of meat. The global human population grew from around 5 billion in 1987 to 7 billion in 2011, and is expected to reach 9 billion people in 2050. 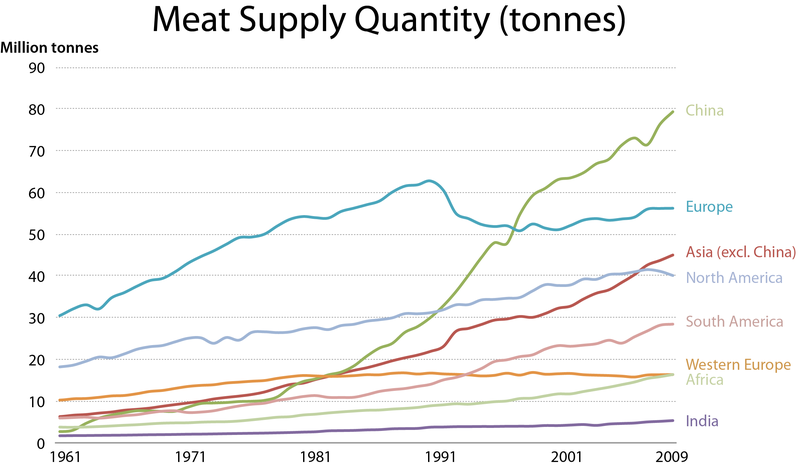 Thus, the total amount of meat produced climbed from 70 million tonnes in 1961 to 160 million tonnes in 1987 to 278 million tonnes in 2009 (FAO 2012a), an increase of 300 per cent in 50 years (Figure 1). The FAO (Steinfeld et al. 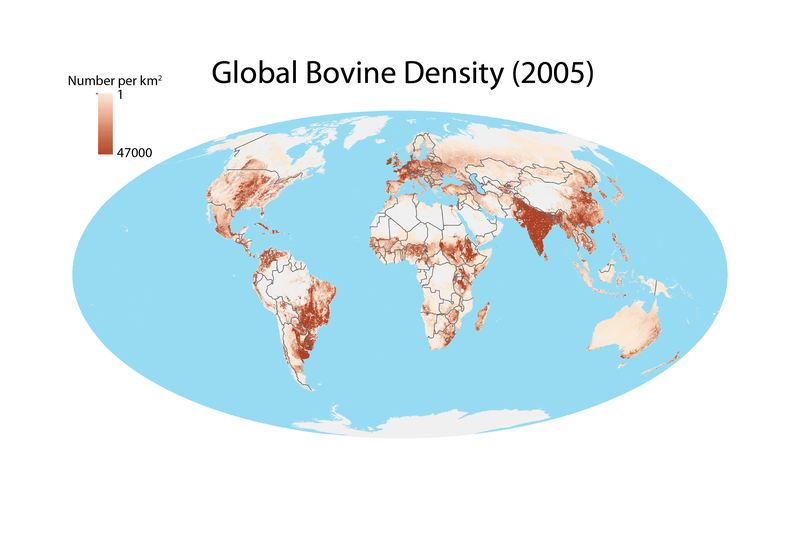 2006) expects that global meat consumption will rise to 460 million tonnes in 2050, a further increase of 65 per cent within the next 40 years. Agriculture, through meat production, is one of the main contributors to the emission of greenhouse gases (GHGs) and thus has a potential impact on climate change. Estimates of the total emissions from agriculture differ according to the system boundaries used for calculations. Most studies attribute 10-35 per cent of all global GHG emissions to agriculture (Denman et al. 2007, EPA 2006, McMichael 2007, Stern 2006). Large differences are mainly based on the exclusion or inclusion of emissions due to deforestation and land use change. Recent estimates concerning animal agriculture’s share of total global GHG emissions range mainly between 10-25 per cent (Steinfeld et al. 2006, Fiala 2008, UNEP 2009, Gill et al. 2010, Barclay 2012), where again the higher figure includes the effects of deforestation and other land use changes and the lower one does not. According to Steinfeld et al. (2006) and McMichael et al. (2007), emissions from livestock constitute nearly 80 per cent of all agricultural emissions. In contrast to general trends of GHG emissions, carbon dioxide (CO2) is only a small component of emissions in animal agriculture. The largest share of GHG emissions is from two other gases: methane (CH4) and nitrous oxide (N2O). These are not only emitted in large quantities, but are also potent greenhouse gases, with a global warming potential (GWP3) of 25 using a 100-year timeframe for methane and a GWP of 296 for N2O. oxide (WRI 2005, McMichael et al. 2007, IPCC 2007) (Figure 6). The main sources of CH4 are the enteric fermentation of ruminants and releases from stored manure, which also emits N2O. The application of manure as well as N fertilizers to agricultural land increases emissions of N2O. Furthermore, N2O as well as CO2 are released during production of chemical N fertilizers. Some CO2 is also produced on farms from fossil fuels and energy usage and, as some authors highlight, by the exhalation of animals, which is generally not taken into account (Goodland and Anhang 2009, Herrero et al. 2011). Additionally, deforestation and conversion of grassland into agricultural land release considerable quantities of CO2 and N2O into the atmosphere, as the soil decomposes carbon-rich humus (FAO 2010). In Europe (the EU-27), for example, enteric fermentation was the main source (36 per cent) of GHG emissions in the livestock sector, followed by N2O soil emissions (28 per cent) (Lesschen et al. 2011). Livestock are also responsible for almost two-thirds (64 per cent) of anthropogenic ammonia emissions, which contribute significantly to acid rain and acidification of ecosystems (Steinfeld et al. 2006). Cattle are by far the largest contributors to global enteric CH4 emissions, as they are the most numerous and have a much larger body size relative to other species such as sheep and goats. 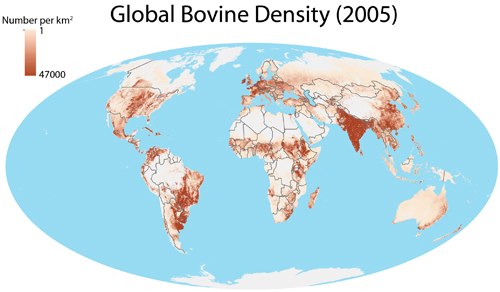 Out of the 1.43 billion cattle (FAO 2012a) (Figure 7) in 2010, 33 per cent were in Asia, 25 per cent in South America and 20 per cent in Africa. Asia is the main source of CH4 emissions, with almost 34 per cent of global emissions (Figure 8). China is a major source of enteric emissions and, while Indians are low meat consumers, India as a country also has high levels of CH4 emissions. Latin America follows with 24 per cent and Africa with 14.5 per cent. China, Western Europe and North America are the regions with the highest emissions from manure. In an analysis of the EU-27 countries, „beef had by far the highest GHG emissions with 22.6 kg CO2-eq/kg“4(Lesschen et al. 2011) in comparison to other products such as pork (2.5), poultry (1.6) and milk (1.3). A study in the UK found that emissions from beef amount to 16 kg CO2-eq/kg beef compared to 0.8 kg CO2-eq/kg of wheat (Garnett 2009). In an analysis of commonly consumed foods in Sweden, the total GHG emissions for beef summed up to 30 kg CO2-eq/kg beef (Carlsson-Kanyama and González 2009).The authors conclude that „it is more “climate efficient“ to produce protein from vegetable sources than from animal sources“, and add that „beef is the least efficient way to produce protein, less efficient than vegetables that are not recognized for their high protein content, such as green beans or carrots“. In terms of GHG emissions „the consumption of 1 kg domestic beef in a household represents automobile use of a distance of ~160 km (99 miles)“ (Carlsson-Kanyama and González 2009). By one estimate, about 35 kilojoules (kJ) of fossil energy are required to produce 1 kJ of beef raised in a CAFO/feedlot (Hillel and Rosenzweig 2008). In many parts of the world „traditional“ forms of animal agriculture have to a certain extent been replaced by a „landless“, high-density, industrial-styled animal production system, exemplified by the phenomenon known as Concentrated Animal Feeding Operations (CAFO). Those „factories“ hold hundreds or thousands of animals, and often buy and import animal feed from farmers far away. The feeding of livestock, and their resulting manure, contributes to a variety of environmental problems, including GHG emissions (Janzen 2011, Lesschen et al. 2011). High-energy feed is based on soya and maize in particular, cultivated in vast monocultures and with heavy use of fertilizers and herbicides. It is then imported (at least in Europe and most parts of Asia) from countries as far away as Argentina and Brazil (Steinfeld et al. 2006). This has serious consequences in terms of land-use change in those feed-for-export production countries. Furthermore, this manure is generated in huge quantities. In the USA alone, operations which confine livestock and poultry animals generate about 500 million tonnes of manure annually, which is three times the amount of human sanitary waste produced annually (EPA 2009). Insufficient amounts of land on which to dispose of the manure results in the runoff and leaching of waste into and the contamination of surface and groundwater. What are the implications and potential solutions? Livestock in many regions of the world, and especially in dry areas, act as a „savings bank“ (Oenema and Tamminga 2005): a principal way of making use of a harsh environment, a „setting aside“ of food (and more generally, the value of this resource) for dry times, a main source of high-protein food. It contributes important non-food goods and services. Livestock rearing and consumption in these regions is a way of life, critical to pastoralists‘ identity, and should be protected and supported. At present, the ecological foundations of agriculture are being undermined (UNEP 2012). At the same time, industrial agriculture is itself contributing to environmental problems such as climate change. However, there are mitigation techniques to reduce the impact of both intensive and non-intensive animal production on climate (McMichael et al. 2007, Gill et al. 2010, O’Mara 2011, Lesschen et al. 2011). Most of these are related to soil carbon sequestration5, „which was estimated to contribute 89 per cent of the technical mitigation potential“ (O’Mara 2011). Many of them have costs of implementation substantially reducing their potential. A reduction of non-carbon dioxide emissions of up to 20 per cent should, however, be possible at realistic costs (McMichael et al. 2007). Other mitigation solutions include improved feedstock efficiency and diets; the reduction of food waste and improved manure management (Steinfeld et al. 2006, McMichael et al. 2007). Farm scale and landscape scale strategies for making agriculture more sustainable are further outlined in Avoiding Future Famines (UNEP 2012). Changes in human diet may also be a practical tool to reduce GHG emissions. As a large percentage of beef is consumed in hamburgers or sausages, „the inclusion of protein extenders from plant origin would be a practical way to replace red meats“ (Carlsson-Kanyama and González 2009). A switch to less „climate-harmful“ meat may also be possible, as pigs and poultry produce significantly less methane than cows. They are however more dependent on grain and soy-products and may thus still have a negative impact on GHG emissions (Barclay 2011). Grass-fed meat and resulting dairy products may be more environmentally friendly than factory-farmed or grain-fed options. Labeling of products, indicating the type of animal feed used, could allow consumers to make more informed choices (FOE 2010). Scientists agree that in order to keep GHG emissions to 2000 levels the projected 9 billion inhabitants of the world (in 2050) need to each consume no more than 70-90 grams (McMichael et al. 2007, Barclay 2011) of meat per day. To meet this target, substantial reductions in meat consumption in developed countries and constrained growth in demand in developing ones would be required. A reduction in the consumption of meat, especially red meat, could have multiple health benefits, as there is clear evidence of a link between high meat diets and bowel cancer and heart disease (FOE 2010). A study modeling consumption patterns in the United Kingdom estimates that a 50 per cent reduction in meat and dairy consumption, if replaced by fruit, vegetable and cereals, could result in a 19 per cent reduction in GHG emissions and up to nearly 43,600 fewer deaths per year in the UK (Scarborough et al. 2012). However, the health effects of nutrient deficiencies that may result from reduced meat and dairy consumption still would need to be examined. In short, the human health implications of a reduced meat diet need further exploration, but it seems probable that many benefits would accrue from lower consumption rates in many developed and some developing countries. At the same time, reduced meat production would ease both pressures on the remaining natural environment (i.e. less new land clearance for livestock) and on atmospheric emissions of CO2, CH4 and N2O. As changing the eating habits of the world’s population will be difficult and slow to achieve, a long campaign must be envisioned, along with incentives to meat producers and consumers to change their production and dietary patterns. „Healthy“ eating is not just important for the individual but for the planet as a whole. 1 In the normal livestock digestive process microbes in the animal’s digestive system ferment food, converting plant material into nutrients that the animal can use. This fermentation process, known as enteric fermentation, produces methane as a by-product. 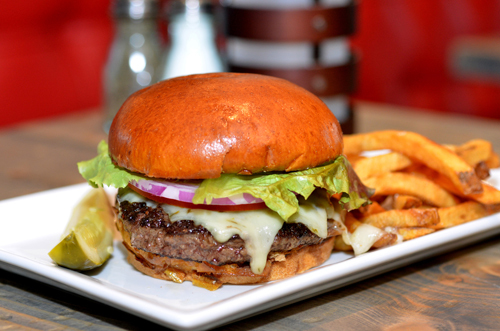 2 Roughly, the equivalent of three hamburgers. 3 GWP compares other gases‘ warming potency to that of CO2, which has its GWP set at 1. 4 The term „CO2 equivalent“ is a metric measure used to compare the emissions from various greenhouse gases on the basis of their global-warming potential (GWP), by converting amounts of other gases to the equivalent amount of carbon dioxide with the same global warming potential“ (Eurostat n.d.). 5 Soil carbon sequestration is the process of capturing atmospheric CO2 and storing it over long time in the soil. Written by: Stefan Schwarzera, b with inputs from and editing by Ron Witta and Zinta Zommersc. Production and Outreach Team: Arshia Chanderd, Erick Litswac, Kim Giesed, Michelle Anthonyd, Reza Hussaind, Theuri Mwangid. Barclay, J. M.G. (2012). Meat, a damaging extravagence: a response to Grumett and Gorringe. The Expository Times. 123(2) 70-73. doi: 10.1177/0014524611418580. Delgado, C., Rosegrant, M., Steinfeld, H., Ehui, S., Courbois, C. (1999). Livestock to 2020: The next food revolution. Food, Agriculture, and the Environment Discussion Paper 28. Washington, DC, IFPRI/FAO/ ILRI (International Food Policy Research Institute/ FAO/International Livestock Research Institute). Denman, K.L., Brasseur, G., Chidthaisong, A., Ciais, P., Cox, P.M., Dickinson, R.E., Hauglustaine, D., Heinze, C., Holland, E., Jacob, D., Lohmann, U., Ramachandran, S., da Silva Dias, P.L., Wofsy, S.C., Zhang, X. (2007). Couplings between changes in the climate system and biogeochemistry. In: Solomon, S., Qin, D., Manning, M., Chen, Z., Marquis, M., Averyt, K.B., Tignor, M., Miller, H.L. (Eds. ), Climate Change 2007: The Physical Science Basis. Contribution of Working Group I to the Fourth Assessment Report of the Intergovernmental Panel on Climate Change. Cambridge University Press, Cambridge, UK and New York, NY, USA, pp. 499–587. EPA (2006). Global Anthropogenic Non-CO2 Greenhouse Gas Emissions: 1990-2020. United States Environmental Protection Agency, EPA 430-R-06-003, June 2006. Washington, DC, USA. www.epa.gov/nonCO2/econ-inv/dow. FAO (2010). Greenhouse gas emissions from the dairy sector. A life cycle assessment. Food and Agriculture Organization of the United Nations, Rome, Italy. FAO (2012b). Food and Agriculture Organization of the United Nations. Data accesses on Aug 30, 2012 at http://www.fao.org/geonetwork/srv/en/metadata.show?id=12713. Fiala, N. (2008). Meeting the Demand: An Estimation of Potential Future Greenhouse Gas Emissions from Meat Production. Ecological Economics 67, 412-419. FOE (2010). Healthy Planet Eating: How lower meat diets can save lives and the planet. Friends of the Earth. Garnett, T. (2009). Livestock-related greenhouse gas emissions: impacts and options for policy makers. Environmental Science and Policy 12, 491–504. Gill, M., Smith, P., Wilkinson, J.M. (2010). Mitigating climate change: the role of domestic livestock. Animal 4, 323–333. Godfray, H.C.J., Beddington, J.R., Crute, I.R., Haddad, L., Lawrence, D., Muir, J.F., Pretty, J., Robinson, S., Thomas, S.M., Toulmin, C. (2010). Food security: the challenge of feeding 9 billion people. Science 327, 812–818. Goodland, R., Anhang, J. (2009). Livestock and Climate Change. What if the key actors in climate change were pigs, chickens and cows? Worldwatch November/December 2009, Worldwatch Institute, Washington, DC, USA, pp. 10–19. Herrero, M., Gerber, P., Vellinga, T. , Garnett, T. , Leip, A., Opio, C., Westhoek, H.J., Thornton, P.K., Olesen, J., Hutchings, N., Montgomery, H., Soussana, J.-F., Steinfeld, H., McAllister, T.A. (2011). Livestock and greenhouse gas emissions: The importance of getting the numbers right, Animal Feed Science and Technology, Volumes 166–167, 23 June 2011, Pages 779-782, ISSN 0377-8401, 10.1016/j.anifeedsci.2011.04.083. Hillel, D., Rosenzweig, C. (2008). Biodiversity and food production. In: Chivian, E., Bernstein, A. (Eds. ), Sustaining Life – How Human Health Depends on Biodiversity. Oxford University Press, Oxford, UK, pp. 325–381. Janzen, H.H. (2011). What place for livestock on a re-greening earth? Animal Feed Science and Technology, 166-167, 783-796. McMichael, A.J., Powles, J.W., Butler, C.D. and Uauy, R. (2007). Food, livestock production, energy, climate change, and health. Lancet 370, 1253–1263. O’Mara, F.P. (2011). The significance of livestock as a contributor to global greenhouse gas emissions today and in the near future. Animal Feed Science and Technology, 166-167, 7-15. Oenema, O. and Tamminga, S. (2005). Nitrogen in global animal production and management options for improving nitrogen use efficiency. Science in China Series C: Life Sciences 48, 871–887. Scarborough P, Allender S, Clarke D, Wickramasinghe K,and Rayner M. (2012) Modelling the health impact of environmentally sustainable dietary scenarios in the UK. European Journal of Clinical Nutrition, doi:10.1038/ejcn.2012.34. Steinfeld, H., Gerber, P., Wassenaar, T., Castel, V., Rosales, M. and de Haan, C. (2006). Livestock’s long shadow: Environmental issues and options. Food and Agriculture Organization of the United Nations (FAO), Rome, Italy. Stern, N. (2006). The economics of climate change: the Stern review. Cambridge: Cambridge University Press, 2006.